WHEN MY IRISH in-laws were toddlers, the rumbling sound of Boeing B-17 bombers roared overhead Sand Cottage, a very quiet self-catering bungalow just outside Kilkeel in Northern Ireland. Kilkeel Library records show that in December 1943, the primary US Army Air Force units at Greencastle (two miles outside the kitchen window where I am seated) were 4th Replacement and Training Sqn. (Bomb); 4th Gunnery and TT Flight (SP); 5th Airdrome Sqn. ; 8th Air Force Anti-Aircraft Machine Gunnery School; 65th Airdrome Sqn. ; 84th Station Complement Sqn. ; Det. A. 1262nd Military Police Company (AVN); Det. A. 1730th Ordnance Sqn. Company (AVN); Det D1056th Q.M. Company Service Group (AVN) and Det. 237, 18th Weather Sqn. 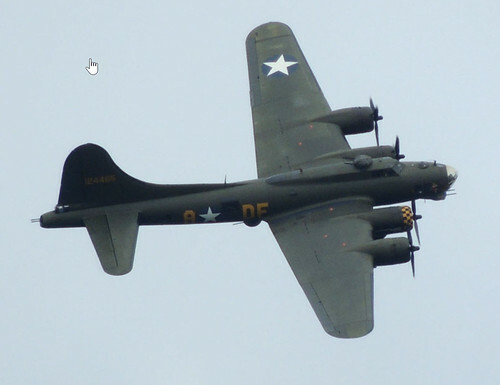 Aircraft stationed at and flying into Greencastle at the time included the B-17, B-24, B-26, P-47, A-20 and A-28. Aircraft carried out gunnery practice near Dundrum Bay, also bombing practice and air to air firing off otherwise peaceful townlands of Annalong and Ballymartin. In the spring of 1944, Generals Eisenhower and Patton flew touched down on the 1.5 mile concrete strip of the Greencastle Airfield, now part sheep pasture and caravan site. The generals inspeted troops of the US 5th Infantry Division stationed throughout Co Down with their HQ at Donard Lodge in Newcastle. I'm walking these grounds on a rainy week in July 2016, remembering what was happening here in the frantic years before the D-day invasion. These images are part of a small Northern Ireland photo collection on my Flickr Irisheyes account.